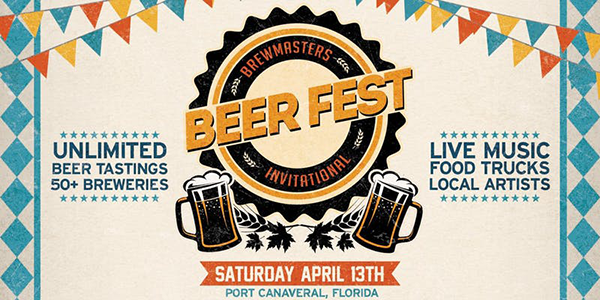 The 5th Annual Brewmasters Invitational Beer Festival takes place on April 13, 2019 at Cruise Terminal #1 in beautiful Port Canaveral. This year, we’ve added to our ever-growing list of breweries, beers, artists, food and entertainment to bring you a beer festival that is grander than ever. The festival will feature more than 50 breweries, allowing thousands of attendees to sample craft (and not-so-craft) beers from all over the world with the primary focus on Florida breweries. Over the past few years, the craft beer industry in Florida has experienced an exponential growth. Many of these local Florida breweries will be attending the Brewmasters Invitational Beer Fest offering complimentary beer tastings. Amazing beer is just the tip of the iceberg at this year’s Brewmaster’s Invitational. Brewmasters Invitational is open to everyone 21+. There will be a full cash bar and food from several of the area’s most popular restaurants and food trucks available for purchase. VIP ticket holders receive early access to the event at 3:00PM, unlimited beer tastings, VIP lounge access, VIP only tastings, and a souvenir glass. Gates open for General Admission ticket holders at 4:00PM and includes unlimited beer tastings. VIP tickets are available in advance for $60. We are only offering a limited number of VIP tickets and these tickets will sell out, there will most likely be none available the day of the event at the gate. General Admission passes are available in advance for $30 each and at the gate for $40 each. Designated driver wristbands will be sold on the day of the event at the entry gates for $10. Designated Driver wristbands give you access to all General Admission areas. If your friends are going VIP then you’ll need to purchase a VIP ticket to enter the VIP area. Brewmaster’s Invitational beer fest will take place on April 13th in Cruise Terminal #1 in Port Canaveral. Follow Brewmaster’s Invitational on Facebook, Twitter and Instagram. *This event is an indoor/outdor rain or shine event. Tickets are non-refundable.